Every bass player should own one of these pedals. As a backup for live use and as a great studio tool, it can’t be beat except by rack mount Tech 21 products with the same circuitry. The Tech 21 SansAmp Bass Driver DI is a workhorse of a pedal, with tone sculpting options and a built in DI. It is housed in a metal case with sturdy connections. Drive: Gain control for pushing the circuitry to overdrive. Presence: Adds Upper Harmonics, just like a tube amp. There are three switches on the unit. The output and XLR switches both are labeled with Line and Instrument. These control the output volume for the ¼ inch output and the XLR output. Line is a boosted signal that is best suited for use when the box is serving as a preamp with only a power amp pushing the sound. The instrument volume is lower, more like the output from the instrument without any effects and is used when the pedal is being used as a DI or more as an effect pedal. The final switch is the ground/phantom power switch. This should be left on the ground lift side most of the time. However, the Sans Amp Bass DI will run on phantom power from the board and if in a serious recording situation, this is the best option. The Bass Driver DI also can use a 9volt power supply or a 9volt battery, secured in place with a fairly flimsy plastic battery clip. That said, it is easy to change the battery and there has been no issue with the one I have been using, for a couple years of hard use now. I’ve used it as a DI for recording bass and upright bass. When used with my upright bass, I was able to dial in a sound that took the normally slightly tinny piezo sound and really warm it back up. So much so that it sounded like I used a high quality large diaphragm microphone, rather than just the Realist pickup running through the Sans Amp direct into the board. The tone is pretty much perfect. The warmth is there and it sounds like a nice big bass rig being recorded. I’ve used the SansAmp Bass Driver DI as a stomp box in times past as well. Cranking up the drive, cranking up the blend and adding some presence, I got the best distortion tone out of my instrument that I have ever gotten. In this capacity, the Level knob acts as the unity gain knob for your unaffected signal. Press the button on the unit and as much distortion as you could ever really need on bass is at your fingers. It can also be used in a more mellow setting as a clean boost, giving you extra cutting power for a solo. 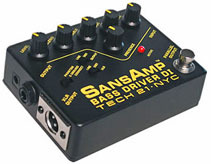 Currently, I use the SansAmp Bass Driver DI in an always-on fashion in front of my amp. I use a Phil Jones Bass rig and while it is amazing, it is a little too clean for most of the music I play. I use the SansAmp Bass Driver DI to dirty up my sound, giving me a great tube amp tone with all of the goodness that the Phil Jones rig has to offer as well. When I got my Bass Driver DI, it was included in a barter. I had an Ampeg bass combo and the guy I bartered with had his “backup” rig, minus the speaker cabinets. It consisted of the Sans Amp Bass Driver DI, a rack mounted Behringer compressor and a rack mounted 2000 watt power amp. Something similar has become my backup rig. In a pinch, this pedal can be run straight into the soundboard but if your amp is in for repair, a power amp and speaker cabinet is all you need. In this capacity, the SansAmp Bass Driver DI works great as well. The line level switch noticeably boosts the volume output, by at least 10dB. The only demerits I give the SansAmp Bass Driver DI are more with the documentation than the actual unit. The selection of settings seems lacking and none are realistically geared toward basses with active pickups and the higher output they put out. The best solution I have found is to back off on the blend when using active pickups. If I was writing the manual I would have an explanation of every single knob and switch in one place as a list, then talk about how to use each one. To find out what the switches do, you have to go digging through the manual, rather than simply reading a quick list. Sound wise though, the SansAmp Bass Driver DI is a gem. It is incredibly versatile and is one of the few pieces of gear I would go replace immediately if it broke or was stolen.